Compare to Techko Maid, Irobot, and Neato Robotic Vacuums. The robotic vacuum that “Cleans while you’re away”. 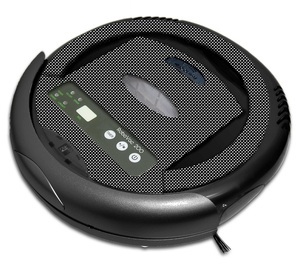 Nexvac announces the introduction of their new robotic vacuum cleaner RoboVac 200. RoboVac 200 comes with a remote control for directing the robot where you would like it to clean. It also has an automatic 5 mode cleaning program to ensure that the unit completely cleans a room. The automatic cleaning program allows you to just press a button and walk away. RoboVac 200 “Cleans while you’re away”. On board sensors tell RoboVac 200 when to back up, turn and clean around an object. RoboVac 200 also has a series of cliff sensors that protect the robot from falling down a flight of stairs. The RoboVac 200 has adjustable cleaning times and the unit runs for up to 80 minutes of continuous cleaning. This design has been in testing for the last 14 months and is based on a model that has been available in Europe for the last 5 years. RoboVac 200 is an improved version of that model. Robovac 200 is your personal robot that sweeps and vacuums so you can spend your time doing better things. From short pile carpet to hardwood to tile, RoboVac 200 handles a variety of surfaces with ease. Robovac 200 goes under beds and other places where upright vacuums can’t go. RoboVac 200 cleans dirt, dust, and pet hair while simultaneously killing bacteria and deodorizing with its ultraviolet light. RoboVac 200 has superior edge and wall cleaning compared to more expensive brands. Pet owners should run their RoboVac 200 frequently to pick up dog and cat hair. Dump the dust cup after each use to keep the powerful motor working at peak efficiency. Clean the reusuable filter with the handy brush. We recommend changing the filter on your RoboVac 200 every 3 months to keep the unit operating at peak efficiency. You can easily do that yourself with the bonus filters included with your RoboVac 200. Compact size remote control is embedded into upper cover. 3.5 hour quick battery charging. Note charge RoboVac 200 for 12 hours before first use. Stops automatically and makes warning beeps if it were to get stuck. Automatically moves out from underneath furniture when it is low on power or has ended its cleaning job. Five step repetitive rotation movement provides the most effective way to clean your rooms. Timer for cleaning time setting adjustable from 10 minutes to 80 minutes on a single charge. Built in slot to put fragrance for odor removal. Great cleaner. It picks up alot of dog hair off my hardwood floors. Very easy to use and saves me time.